Published on July 20, 2016 by Martyn. Be the first to comment! North Yorkshire beckons this weekend with a trip to the wonderfully named Deer Shed Festival, where I’ll be rubbing shoulders with a whole host of musicians, singers, actors, comedians, storytellers, artists and other writers. The family-focused festival, now in its seventh year, is expected to draw a crowd of up to ten thousand over three days of events in the lovely setting of Baldersby Park, between Thirsk and Ripon – 90 acres of parkland whose features include a lake, an obelisk . . . and a historic deer shed. I’ll be giving a talk and reading at 11.30am on Saturday on the Obelisk Stage, which has a capacity of 500 (eek! ), followed by a book-signing. 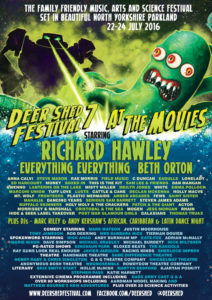 For full details of the festival click to visit the Deer Shed website.